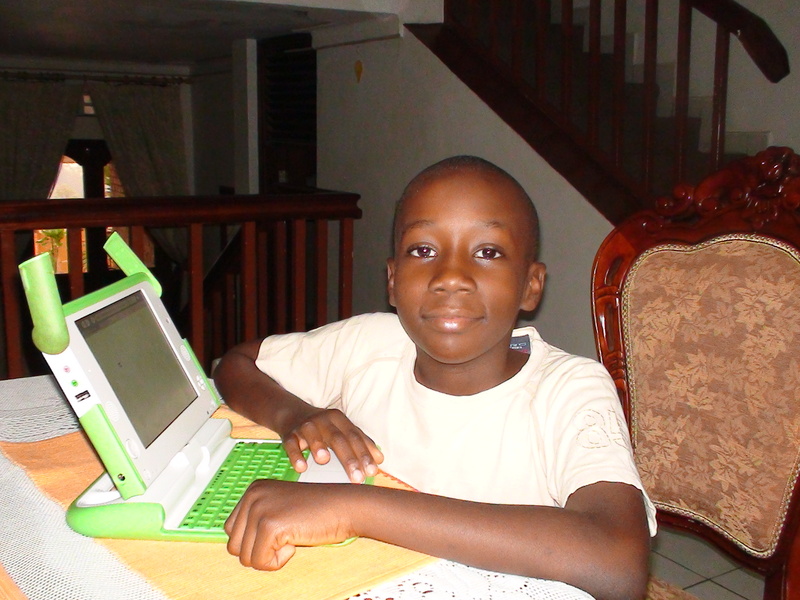 His mother, Jael paid for the laptop in February 2009, but Collin received it in April this year. Collins claims the whole student community at the school right from kindergarten to secondary school got each a laptop. Each pupil had to part with the equivalent of US $ 220.00 in order for one’s son/daughter acquire one. Collin demonstrated to me the possibilities of his laptop and I was impressed. He showed me how he can chat with up to 100 of his fellow students. He did not know how many more, but it seemed like infinitive. The laptop itself is robust plastic and waterproof. It uses icons to display the different applications. In Rwanda the laptop can practically connect to the Internet anywhere in the country. The browser can be used to access Google and other Google applications. The laptop is capable of recording, video, audio and videos. The laptop is capable of saving photos and videos on its hard disk drive whose capacity I failed to establish. Collin further took me through the drawing pictures, making shapes, playing using iconised music instruments. There is the “Tamtam” mini, which does the music using the music instruments available. Kids can compose their own music. When I asked Collin, he seemed to shy to come up with anything. Collin plays games, makes puzzles, has a Gmail account for mail and has Sim city for games. He explained that the battery lasts for about 3 hours. The laptop has 3 USB ports. During our group discussions at the university of Amsterdam, I ended up being nicknamed “Negronywa ” or “Balugronte” because of my opposition to Negroponte’s One Laptop per Child initiative for the developing world. The corporate members are AMD, Brightstar, Chi Lin and eBay, Google, Intel, Marvell, News Corporation, Nortel Networks, Quanta Computer, Red Hat and SES Astra. Intel is the world leader in silicon innovation, it develops technologies, products and initiatives to continually advance how people work and live. Well as I did appreciate Prof. Negroponte’s initiative, the rate at which he was falling out with partners and adjusting the price of the computer from the original US $ 100. Intel joined the OLPC initiative in July 2007 and took a seat on the organization’s board of directors. It also pledged at the time to help fund the group’s efforts. During its participation, it developed an XO laptop that included an Intel chip. However, OLPC executives claim that the company failed to deliver on its agreement when it joined and was attempting to undermine the program. It was a matter of time and Intel dropped off. What is not gratifying however, is OLPC’s new mate; Microsoft. OLPC’s new operating system after Intel left is now windows. From the very beginning, Negroponte was wary of Microsoft because of his profit-oriented business. And for them now to be in bed together is surely amazing. Microsoft does not invest where there is no profit. Any surprise that the laptop is now US $ 190, up from 170 a few months before? « What is a ‘blogger’?